Want to See Beth Moore in Person? Powell's Chapel has a limited number of tickets available for women to attend Beth Moore Living Proof Live in Nashville on August 5-6. Cost is $59 per person. Sign up today or email to secure your spot. LifeWay Christian Resources is slated to bring well known Bible teacher and best-selling author Beth Moore to the Municipal Auditorium, August 5-6, 2016. Living Proof Live, sponsored by Nashville-based publishing company LifeWay Christian Resources, will feature Moore’s dynamic storytelling and passionate Bible teaching. The event, which is now in its 18th year, both challenges and encourages women to grow deeply in their faith. Moore has authored dozens of published Bible studies, books, and devotionals specifically for women for nearly two decades. Her latest LifeWay-published releases are Audacious (October 2015) and Children of the Day (May 2014). Moore’s organization, Living Proof Ministries, is based out of Houston. Dove-award winning musical artist Travis Cottrell, who also serves as worship pastor of Englewood Baptist Church in Jackson, Tenn., is slated to lead worship for the event. 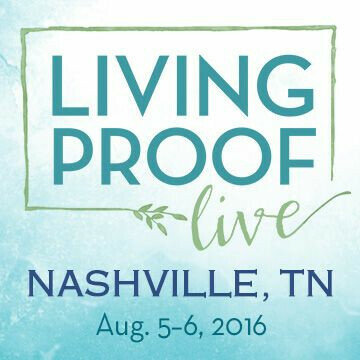 Living Proof Live starts Friday, August 5 at 7:00 p.m. and concludes for the evening at 9:30. It starts back up the following morning at 8:30 and ends at 12:15 p.m.
Powell's Chapel will celebrate its 141st anniversary in July 2016. 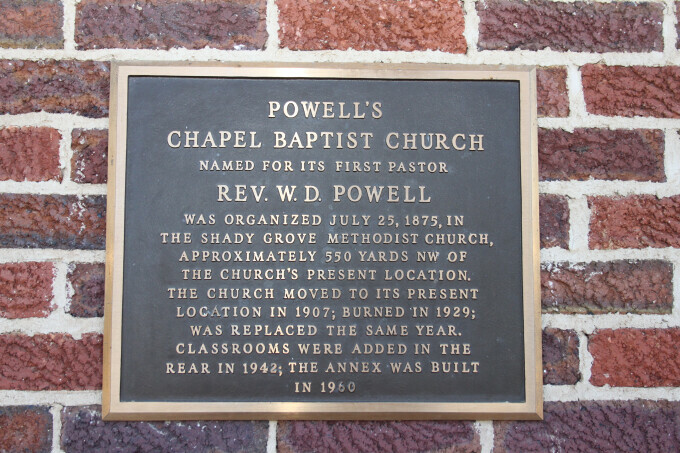 This is first of a series of blog posts to highlight the rich history of Powell's Chapel and its impact on the local community. In the summer of 1875, in the middle of this evangelical emphasis in Tennessee, a twenty-one year old student from Union University in Murfreesboro traveled through the Fall Creek area in northern Rutherford County near the Wilson County line. William David Powell taught school at Rockdale Academy in a nearby community, and he passed an abandoned Methodist Church on his way home. He talked to the teacher, Miss Eliza Crosthwait, at the community’s school about the possibility of starting a Baptist Church in the area, using the abandoned building as a meeting place. She identified eight women and two men affiliated with the Baptist faith. Rev. Powell held a series of meetings in the abandoned Shady Grove Methodist Church building in July of 1875. At the final meeting on July 25, Powell, along with fellow preachers George E. Truett and Enoch Windes, invited individuals to unite with the church. Ten responded and became the founding members of Powell’s Chapel Baptist Church: Callie Jones, Sarah Short, Miss P. P. Sanders, Elizabeth Short, Mariah J. Malone, Martha Tucker, Sarah A. Short, Mary A. Harris, William Short, and William Barrett. Powell, as moderator, called for a ballot to name the church, and the members unanimously chose Powell’s Chapel Baptist Church. In October of 1875, the church held a ten-day meeting and added twelve more members bringing the congregation to twenty-two. The members who joined in October were: William A. Evans, Martha M. Evans, John B. Vaughter, Sarah J. Vaughter, Mrs. Ann E. Tucker, Lucretia C. Harrison, Persilla A. Harrison, Miss Harriett Barrett, E. A. Shotwell, Miss Charlotte Barrett, and Miss Willie Short. While the names of the pioneers of Powell’s Chapel are well noted in the church’s history, little has been told of their lives. Who were these twenty-two people and what was the true make-up of the church after its first series of meetings in October of 1875? No correspondence from these original members exists, but much can be gleaned from census records and other public documents to paint a picture of the people who founded the church and the lives of the surrounding community in 1875. The data in public records from the time identify several trends in the membership of the church. As of October 1875, the church membership included sixteen women and six men. They ranged in age from seventeen to over fifty. Most of the women in the congregation were younger than fifty with a number of children at home. The members owned land in the area surrounding the church. They were neighbors and many were family. Church attendance also included several children who probably attended with their mothers or both parents illustrating their desire to raise families in the church. Source: Data compiled from the 1870 and 1880 United States Census. One of the most noticeable trends evident from church records is the role of women in populating the church. Powell’s Chapel Baptist Church would not exist without the commitment of the strong women in the community. Paul Harvey in Redeeming the South: Religious Cultures and Racial Identities Among Southern Baptists, 1865-1925, writes that “Rural men improved houses, land, and machinery, but still conceived of religion as a ‘nickel-and-dime’ business to be fostered chiefly by women.” Southern Baptist women took advantage of their roles in religious life to expand their sphere. They worked together and formed societies to rebuild churches, pay ministers, fund orphanages, and support missionaries around the world. Edward Ayers writes that “Many women of both races found in the church their greatest sanctuary. Women played increasingly important roles on church committees—especially those dedicated to fund-raising—and assumed positions of greater authority.” It was the women who funded missions, maintained the church buildings, and took care of the needy. Like many of their fellow Baptist sisters, the women of Powell’s Chapel stepped up early as leaders of the church. One of the most influential women was Mariah Hoover Malone. The elder stateswoman of the church founders, Mariah Malone was seventy-one when she joined Powell’s Chapel. Shortly after constituting as a church body, Powell’s Chapel took steps to elect leaders for the new church and did not ignore the ladies in the congregation. While most leaders elected were overwhelmingly male, Martha M. Evans was elected as the first treasurer. This role allowed Evans a leadership role in the church but kept her within acceptable social boundaries. Many women managed the finances for their homes so the role of treasurer fit within social norms. Men were expected to lead the congregation while women served as moral examples for their families and community. Martha served as treasurer for three years and started a great tradition of service to God by the women of Powell’s Chapel. Sarah Short and Sarah A. Short are two different women who were both founding members of Powell’s Chapel Baptist Church. Ages at the time of the founding of the church calculated by ages listed in 1870 and 1880 United States Census Records. Paul Harvey, Redeeming the South, 81. Edward Ayers, The Promise of the New South: Life After Reconstruction, 15th Anniversary Edition 169.